An interactive afternoon for People Living With Parkinson's, their Families and Partners, Allied Health Professionals, Research Scientists, or other Medical Care Providers, Exercise Scientists & Exercise Trainers, Somatic Practitioners or members of the local or regional Parkinson's support community. This workshop will clarify the relevance of Alexander technique (AT) based "active learning" interventions as part of a contemporary Care Team approach for treatment of Parkinson's motor and non-motor symptoms. As a Person Living with Parkinson's (PlwPD) you can learn how to begin applying Alexander-based strategies to help improve your balance, alignment and movement, and prevent falls and "freezing." As a Care Partner of a PlwPD you can learn how to begin applying Alexander-based strategies to help meet the day-to-day physical and emotional stresses of caregiving. For Allied Health Professionals, Research Scientists, or other Medical Care Providers the workshop is designed to offer a new understanding of the relevance of Alexander technique (AT) based "active learning" interventions as part of the contemporary Team Approach for treatment of Parkinson's symptoms. The main objective of this workshop is to introduce the potential for Alexander technique (AT) to become an important part of the care team approach for managing symptoms for People Living With Parkinson's. This workshop is free, but tax-deductible contributions of any amount will be gratefully collected as a fundraiser for the Alexander Technique charity, The Walter Carrington Educational Trust and their AT for Parkinson's Project . The funds will be used for subsidising AT-based programming for PlwPD and their care partners. or donate now at this link. This symposium is a media event and will be videotaped. By attending you are giving your permission for photos and video images recorded of you at this event to be used for educational and promotional purposes by The Poise Project® and AT4PD. Please wear loose clothing that allows you to move in a relaxed way. No need for exercise clothing! You may wish to bring a mat, blanket or towel for the Active Rest time, which is usually carried out lying on the floor. You may also easily do this activity sitting in a chair if you prefer. "A New Member of the Interdisciplinary Care Team: The Skilled Patient - Alexander Technique training for Patient Self-regulation with Long-term Retention of Benefits"
THE POISE PROJECT® is a 501(c)3 nonprofit organization launched in 2016 to bring Alexander technique principles to new populations, and to increase accessibility across broad socio-economic groups. Our Mission is maintaining natural poise and personal growth throughout all stages and challenges of life through the principles of Alexander technique (AT). 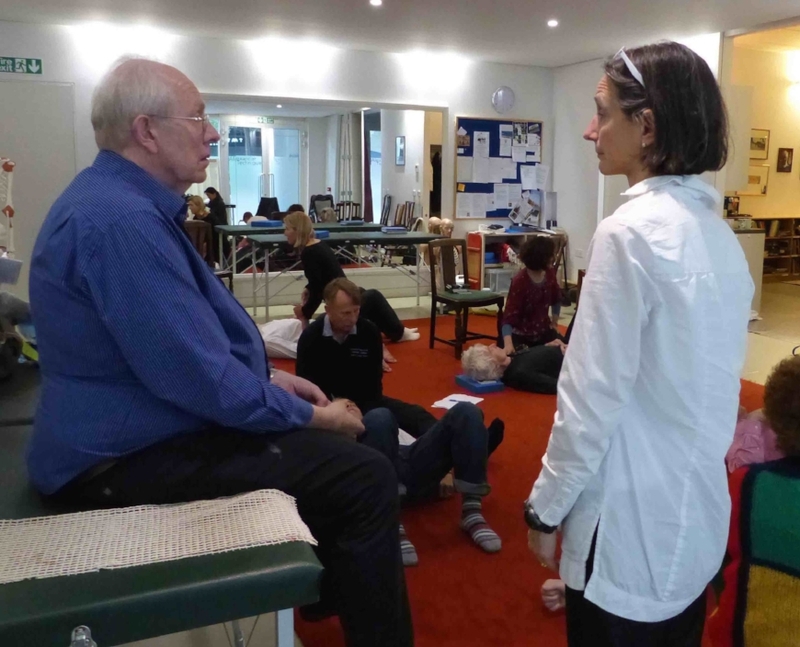 The Poise Project® Executive Director, Monika Gross, teaching some ease of sitting balance at workshop at the Constructive Teaching Centre, London, October 2016. MONIKA GROSS is Executive Director of The Poise Project, a nonprofit with the mission of maintaining natural poise and continuous personal growth throughout all stages and challenges of life through the principles of Alexander technique (AT). The Poise Project is committed to removing barriers and making AT available across socio-economic groups and to those with chronic conditions. It received a $25,000 Parkinson's Foundation 2017 Moving Day® Community Grant to deliver "Partnering with Poise," an AT-based course for care partners of people living with Parkinson's disease, at six sites across North Carolina. We have just been awarded a second Parkinson's Foundation Moving Day® Community Grant for $10,000 to expand our "Partnering with Poise" care partner course to the Washington DC area in Fall 2018. Monika had her first AT lesson in 1976 and was certified in 1985 in Lydia Yohay's (ACAT) teacher training program in NYC. She is a teaching member of the American Society for the Alexander Technique (AmSAT) and Alexander Technique International (ATI), as well as a member of the local regional AT teacher consortium Alexander Teachers of the Mountain Region (ATMR). She is also a Registered Somatic Movement Educator with the International Somatic Movement Education and Therapy Association (ISMETA). Monika holds a BFA in Drama from the North Carolina School of the Arts. Monika is co-owner of Form Fitness & Functiona, and has a private AT practice in Asheville and in Charlotte NC. She also offers AT training via Skype or Zoom.